Being in the moment at a memorable event is priceless. Everything that takes place in front of you will stick in your head for years. Unfortunately, the retelling of happenings like these often end abruptly with the phrase, “Well, I guess you just had to be there.” Heck, even being present for the occurrence doesn’t mean you had the best view of it. 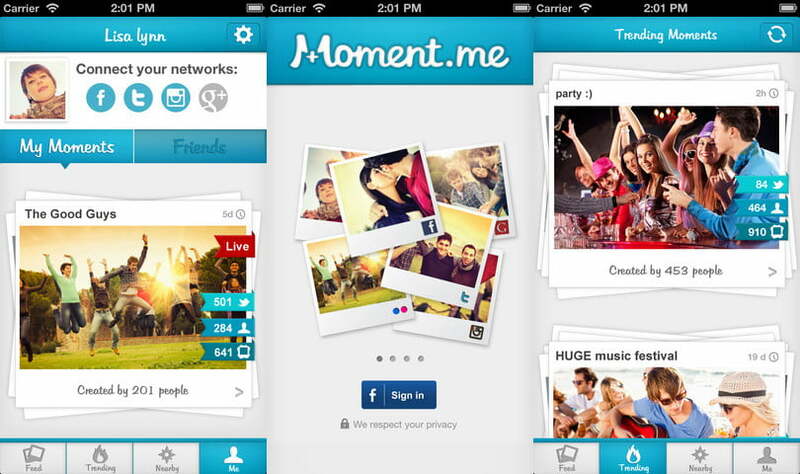 Moment.me is an iPhone app that aims to fill the gap in your memory by providing a panoramic picture of the event. Think of the movie Vantage Point, but remove Dennis Quaid–unless you’re close personal friends with Dennis Quaid. It’s kind of like that. What Moment.me does is essentially crowdsource moments in time. When you sign up for an account, you’ll be able to link your existing Facebook, Twitter, Instagram, and Google+ accounts to it, among others. In doing so, you give Moment.me access to your friend networks on all these accounts. 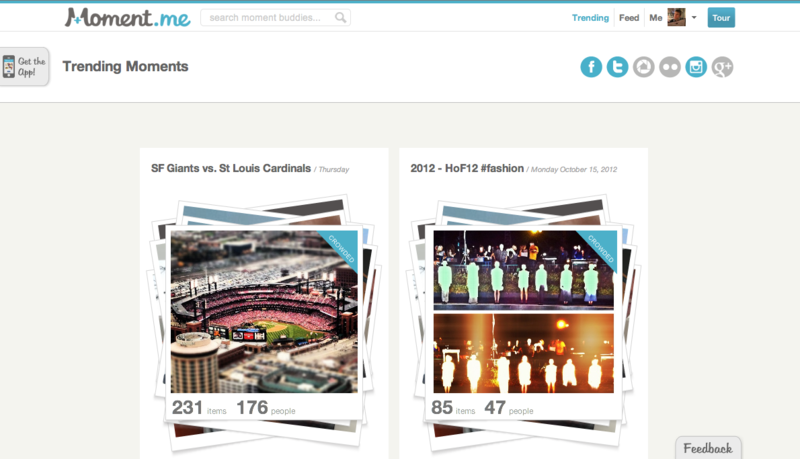 This enables the app to create a “Moment” out of shared images, videos, comments, and tweets. In theory and in the sales pitch, it works to create a moment using content from your social networks, even if the other people aren’t Moment.me members. A feature called Moment Buddies promises to add to your collection of content from people that share common experiences with you. If Moment Buddies works as promised, it will take shared experiences to shared interests and shared friendship. If you usually share content exclusively with select groups or are doing so in a way that is meant to be private, Moment.me respects that. It abides by all the terms and conditions of the social networks it connects with, meaning that if you didn’t share something globally, it won’t be viewable by the public. Eventually, you’ll actually be able to see a view of your extended network and a separate view of everything shared from the particular event. In practice, Moment.me isn’t quite as picture perfect as it first appears. The retroactive moment builder — which creates moments based on your already existing content — put together my moments and matched the people I had tagged. However, it wasn’t quite as solid during a live event. I attended a concert with some friends, took pictures, and tweeted about. It didn’t grab any content from strangers or extended network members, though I can confirm from the camera flashes and the phones being held in the air like digital lighters that there were indeed other attendees. It put together the memories I captured, but didn’t provide any expanded view of those memories with others included. Hopefully this is something that gets fixed, and may benefit heavily from the inclusion of Moment Buddies. To be totally fair, the app is still quite new, but scrolling through the public events that it does put together makes you wish it worked properly all the time. It’s hard to judge a product like Moment.me so early, but it’s also hard not to root for it. The best way to do that, of course, is to download Moment.me for iPhone and encourage others to do the same. The service appears to work better when people are connected through it, and the fact that it works off existing social networks makes it low maintenance and rather convenient. You don’t have to manage or organize things; you just log in to Moment.me after an event and take a look at all the angles you may have missed. It’s a great idea that, at it’s best, will provide a new perspective on what is happening around us. At worst, it makes a nice collage of your own experiences.